If you spend enough time in the woods you will eventually stumble on some wildlife that could turn out to be dangerous. I’m not sure I’d use this to warn off an angry grizzly, but for just about everything else this Pepper Spray Self Defense Gun gives me the range to make them go away without having to worry about getting hurt myself. I’ve come back from a long day of hiking and climbing to find that someone dumped scraps into the fire pit but didn’t have good aim. We had a family of rather large raccoons sitting around the edge of the pit chowing down. They were completely not afraid of us. Screaming, didn’t bother bother them. Sticks, I couldn’t throw one big enough to make them care. Pepper Spray pellet? They were gone. 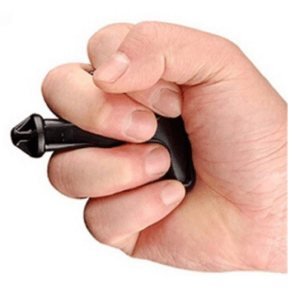 Outside of the wilderness this Pepper Spray Self Defense Gun is a great less than lethal weapon. Want to break up a group of looters? You’ve already boarded up and now a group of your neighbors who weren’t prepared for the ZA are banging on your door. You don’t want to shoot them – because that would tell others where you are and you don’t really want to kill them if you don’t have to. Right? LONG DISTANCE FOR YOUR PROTECTION – 150+ feet and 21 shots of proven range vs. 6-10 feet for normal pepper spray. MILITARY STRENGTH – Proven safe and effective by agencies including the U.S. Military, State police and the Federal Bureau of Prisons. MOST RELIABLE – Our military strength pepper spray has a 5-year shelf life (more than double the industry standard). EASY TO USE – No violent kick or loud bang when fired. Can be loaded ready to use indefinitely, so when you’re in need, SALT is ready. When it comes to surviving the immediate craziness after a natural disaster, massive power outage, or mass migration due to flooding, being able to take care of yourself and defense yourself is really important. Keeping your hands in good shape with these Hard-Knuckle Riot Control Gloves. With them on you can take care of business, all while keeping your hands from getting beat up and battered. Post ZA these Gloves will also give you that extra moment when the undead are biting down on your hand to react – and hopefully stick a screwdriver through its eye socket before it can crush any bones. This Self Defense Stinger Duron Drill fits easily onto my key ring or into a jacket pocket so if punches start to fly I can defend myself, and since it’s less than lethal its an option if you just need to make a point and don’t want to kill anyone. Keep one in your glove box, on in your pocket, and another on your key ring. Be prepared no matter what happens. Made of nylon steel, hard as metal alloy. Girls or travelers self defense tools. Designed to conform naturally to hand and fingers. I keep one of these Glass Breaker pens in my car. It is great to write down the occasional directions or part number and I know that if something happens and I need a window punch, I have one safely, and discretely at hand. When it comes to survival having the right tool at the right time is just as important as having food and weapons stockpiled at your bolt hole. What good is all that gear you’ve got squirreled away if you die before you can get to it? Which is why I keep a second Glass Breaker Self Defense Pen in my shirt pocket whenever I am out and about. To everyone around its just a nice pen, to me it is a lifeline if the sh*t hits the fan. If things go south, I know that no matter where I am I have a tool to help me defend myself and that gives me options. ALWAYS BE PREPARED: Don’t be defenseless. Feel confident that you can fight back against a sudden attack if needed. Both the pointed and rounded ends can be used against an assailant, making it doubly effective. ELEGANT AND DISCREET: Unassuming in appearance, yet this is a seriously tough and damaging survival tool if needed. Attractive and sleek-looking, it is perfect for the home or office as well as in the field for use as a pen and a tactical back-up. The pen cap slides conveniently onto the opposite end when in the writing mode so as not to get lost. HIGH STRENGTH: Aircraft grade aluminum makes this rugged pen surprisingly strong, light weight and comfortable to use. With a satin (matte) anodized finish, it measures 5 7/8 inches long, weighs 1.2 oz, comes with two black ink cartridges and uses easy to find refills such as Parker Gel and Fisher Space. IDEAL LENGTH AND WEIGHT: We created this for everyday carry as well as last ditch personal protection for both men and women. It was designed to be the best tough, reliable and powerful defensive tool and pen that you can have with you at all times, even while traveling. 100% MONEY BACK GUARANTEE: We are a family-owned American company and if you are not happy with your Practical Tactical Pen, just return it and we’ll refund your money or replace it if there is a problem. A LIFETIME WARRANTY is available by contacting our website, shown in the instruction sheet that arrives with the pen.